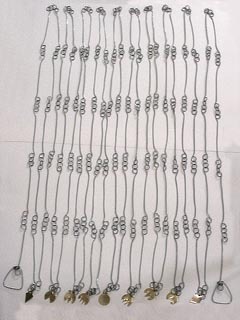 Copyright 2002 by David Manthey. Click on images for a larger version. This is how I made a Gunter's chain (also known as a survey chain). 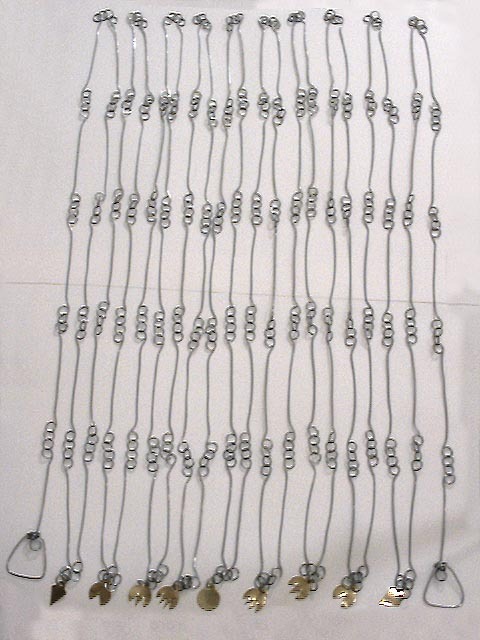 The total length of a Gunter's chain is 4 poles (66 feet), and the chain is composed of 100 links. Each link is joined to the next by one or two round rings; I chose to use two rings. The link plus associated rings are exactly 7.92 inches in length. The first and last links are handles. Every ten links there is a brass tag that identifies the number of links. At link 10 and link 90, the tag has one point. At link 20 and link 80, the tag has two points. At 30 and 70, three points, and at 40 and 60, four points. At link 50, the halfway point, a round tag is used. I chose to use rings with an inner diameter of 1/2 inch. I also used this as the nominal inside diameter of the eyes of each link. This is a typical value for historic chains. 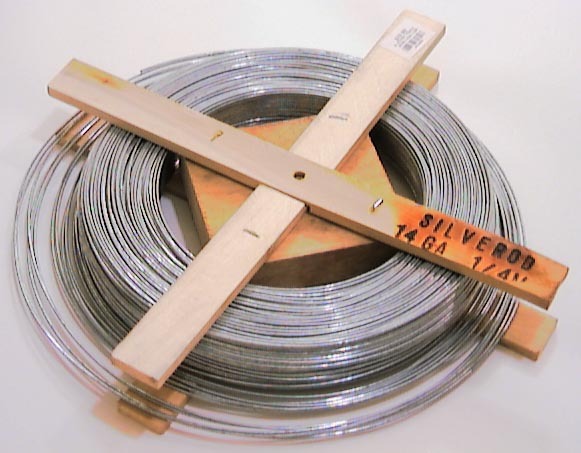 Wire - 14-gauge galvanized steel wire. I purchased a 1/4 mile spool of this from Agway (the local farm supply store) for $20. It was intended for use with electric fences. This is probably enough to make 8 chains. 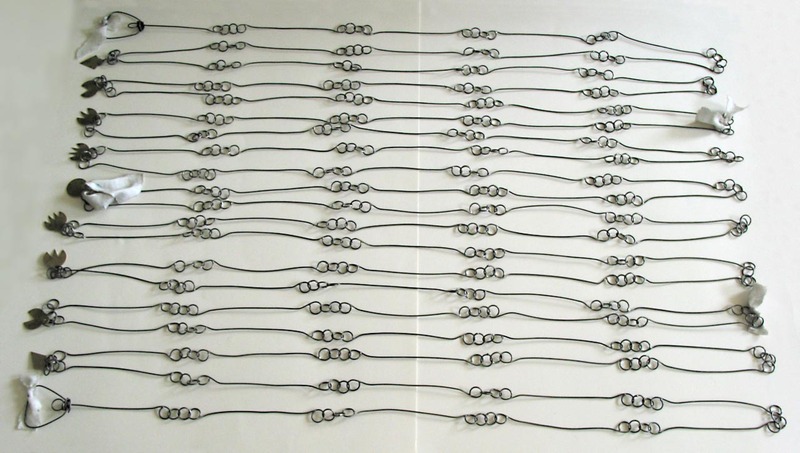 Historically, chain wire ranged in size from 14 gauge to 8 gauge. 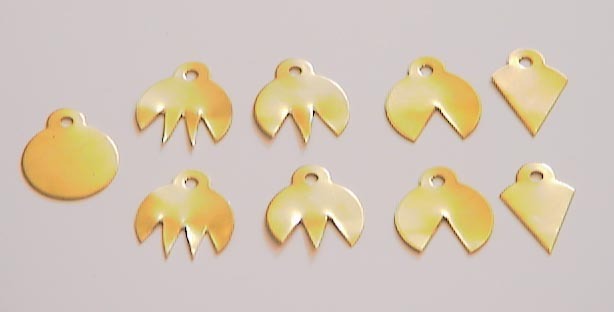 Brass Tags - Used for the ten-link markers. I ordered a bag of 25 from McMaster-Carr, part 1540T22, 1 1/4" diameter, with ear. This cost around $8 plus shipping. Nine are needed (plus any that get fouled up). 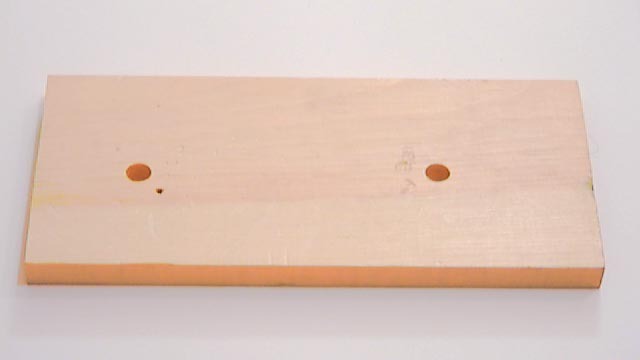 Link Jig - This is a wooden board with three holes drilled in it. There are two 1/2 inch diameter holes (the inner diameter of the eyes of the links), at a center-to-center distance of 6.42 inches (7.92 minus the inner diameter of the rings multiplied by the number of rings and minus the inner diameter of the link eye). There is a small hole near one of the 1/2 inch holes that is a little larger than the diameter of the wire. The placement and size of this hole need not be exact. 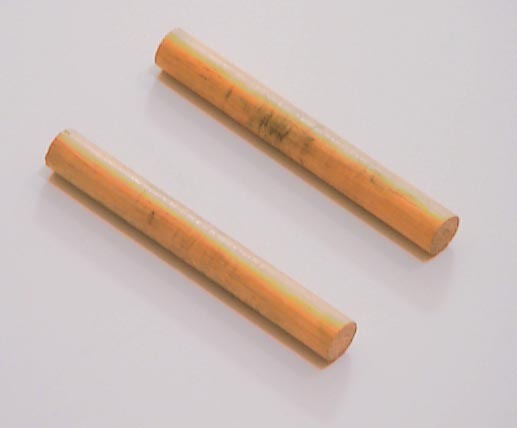 Dowels for Link Jig - These are two dowels of equal length and the same size as the inner diameter of the eye of the link. In this case, I made them 4 inches long and 1/2 inch in diameter. Ring Winder - This is a dowel the same diameter as the inner diameter of the rings with a hole drilled through near one end. The hole needs to be slightly larger than the diameter of the wire. 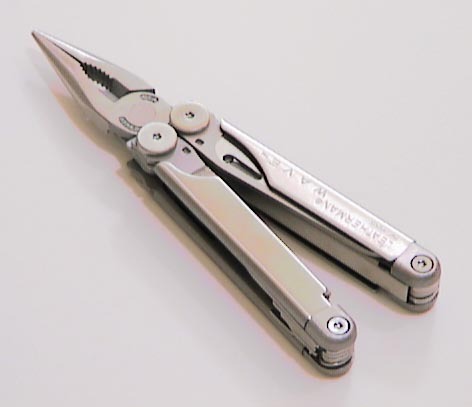 Wire Snips - These are the most frequently used tool. 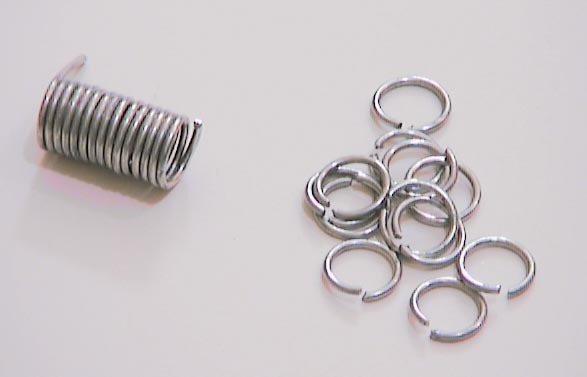 They need to be able to cut the wire easily, not be too tiring, and have small enough jaws to fit inside a coil of wire with the chosen ring diameter. 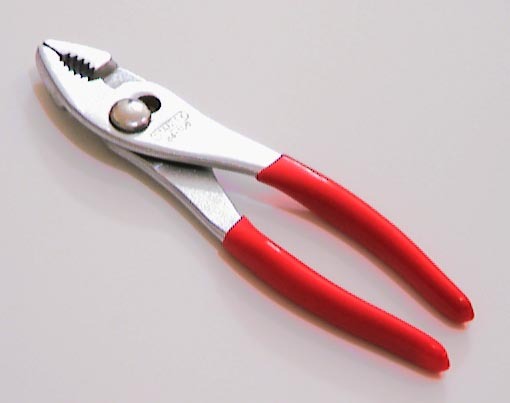 Pliers - These are used to help shape the links, close rings and link eyes that have gaps, and to generally manipulate the rings. The round section designed for gripping nuts is useful to grab rings and eyes. Needlenose Pliers - These are used to help form the neck on the links immediately adjacent to the eye. 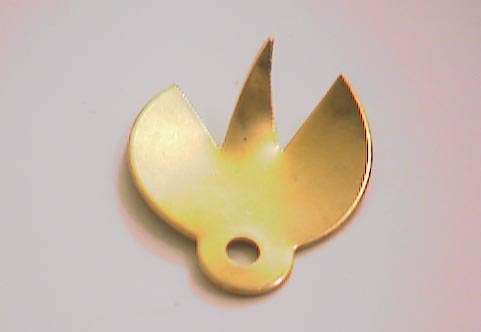 They are also useful for flattening the brass tags after they have been cut. 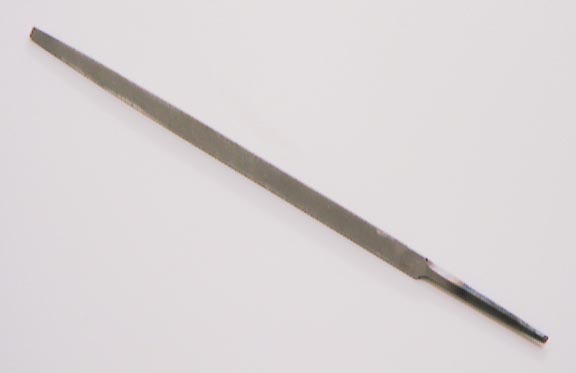 Screwdriver - A flathead screwdriver is useful for prying apart link eyes and rings. Metal File - This is used to deburr the edges of the brass tags. A triangular file is useful because it can reach into the 'V' on the tags. 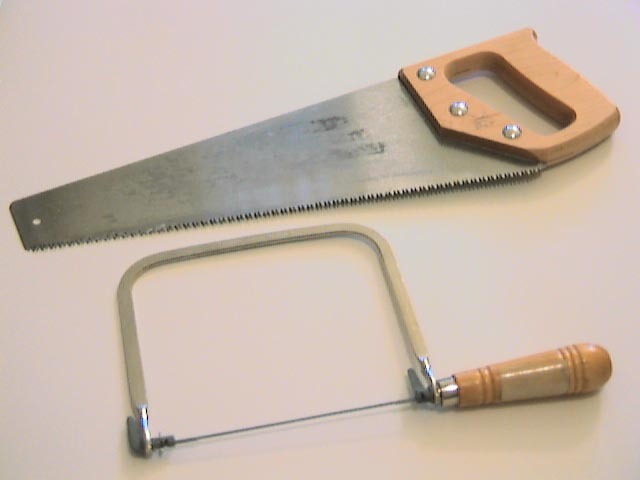 Wood Saws - Used for making the jig and cutting the dowels to length. 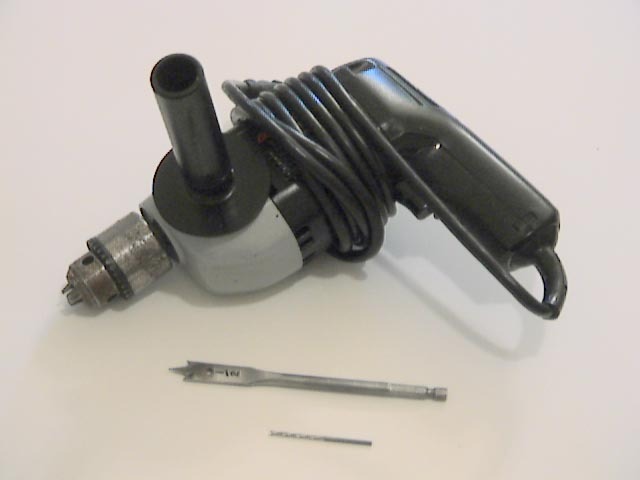 Drill and Bits - Used for making the jig and boring a hole in the ring-winder. A bit the size of the inner diameter of the link eyes is needed, plus a bit slightly larger than the diameter of the wire. I used 1/2 inch and 3/32 inch bits. Tape Measure - (not shown) - One needs to verify the chain somehow. Although the average carpenter's tape measure isn't as reliable as actual survey equipment, it is adequate for a rough chain such as this. Pencil - (not shown) - For marking the jig, the tags, and other items. Safety Equipment - (not shown) - Eye protection is a must. Gloves are a good idea. 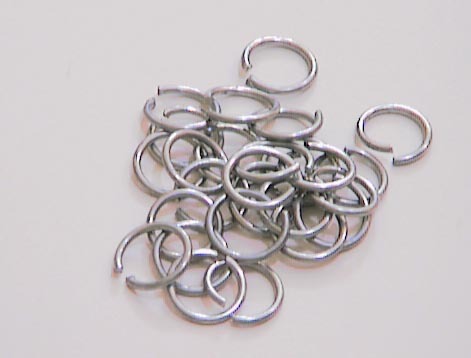 For a chain with two rings per link, 198 rings are needed. Additionally, each of the nine tally tags is held on by another ring, bringing the total to 207 rings. 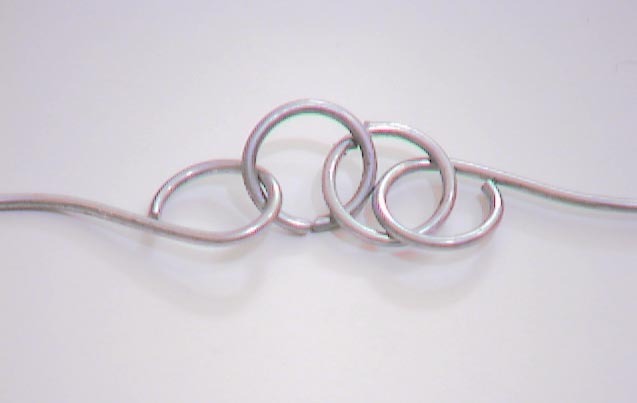 It is convenient to make a few rings as one is making the links (see the section on making links below). However, some rings will need to be made by themselves. 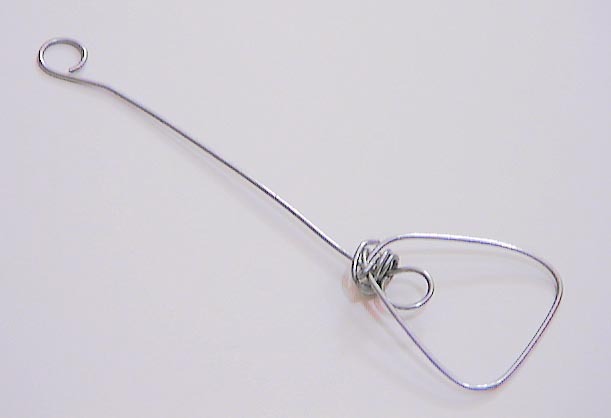 Step 1 - Cut some wire - Cut off a comfortable working length of wire. I found that less than four feet was too little to bother with, while more than eight feet was too much of a pain to work with. If you use an automated winder (see comments on later steps), you will want to work with more wire at a time. I found that the appropriate length was roughly 1 1/2 loose coils off of the spool of wire. 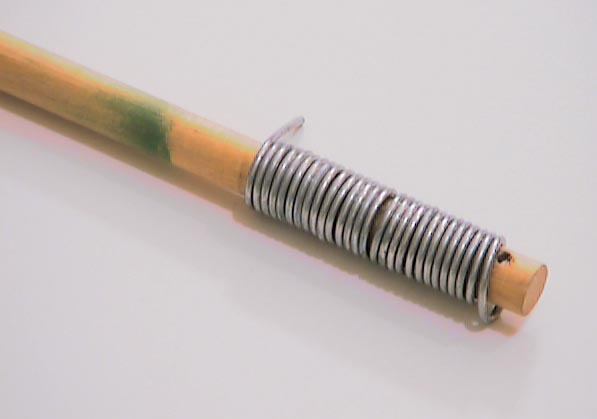 Step 2 - Put the wire on the winder - Insert one end of the wire into the hole near the end of the winding stick. The wire should go most of the way through the hole but not emerge from the other side (otherwise, there will be a sharp point of wire waiting to scratch you). Bend the wire over and begin to wrap it around the winder. 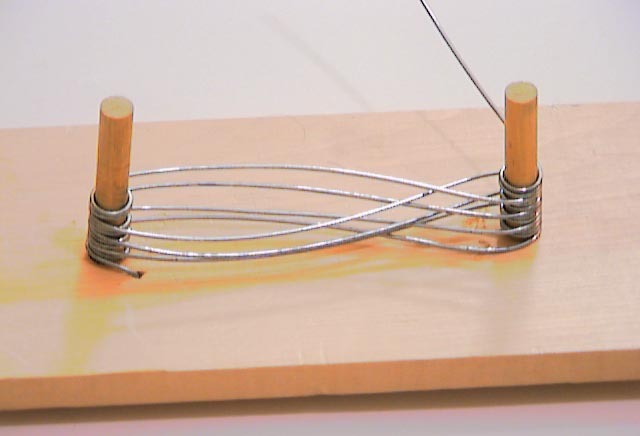 At first it is easy to turn the winding stick, but after a while it becomes easier to grip the winding stick firmly and spin the wire about it. Step 3 - Wind all of the wire - Continue winding until all of the wire is on the winding stick. Be sure to lay the wire on evenly with no overlap. Also be sure that the wire is snugly against the stick. An automated winder can be made by mounting the winding stick between two upright boards (though a hole drilled in each) and spinning the winding stick with a drill. Wear gloves. Websites that detail how to make chainmail have drawings for such a device. 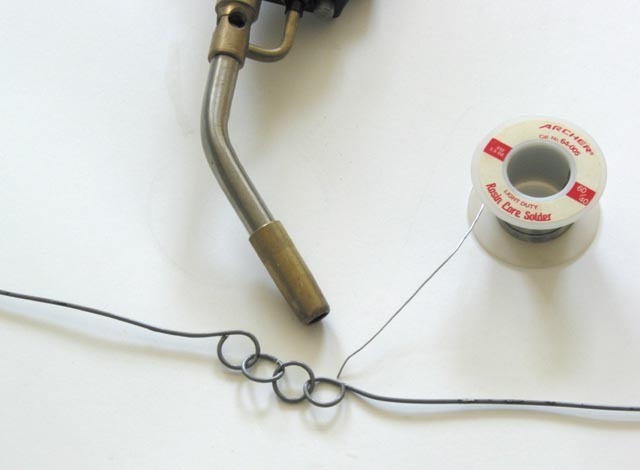 Step 4 - Remove the wire from the winder - Use the wire snips to cut the wire just where it comes out of the starting hole. 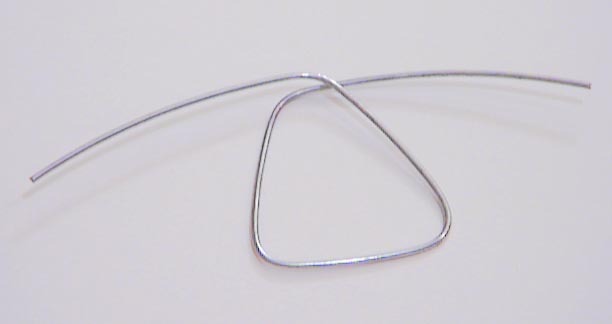 The wire in the starting hole can now be removed and discarded. 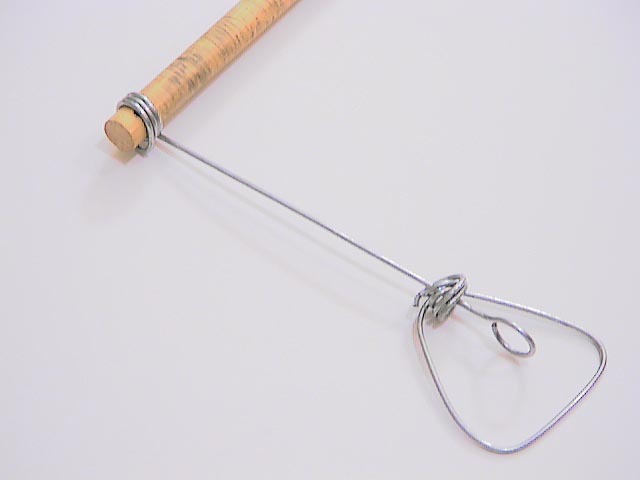 The coil of wire will slide off the of the winding stick. 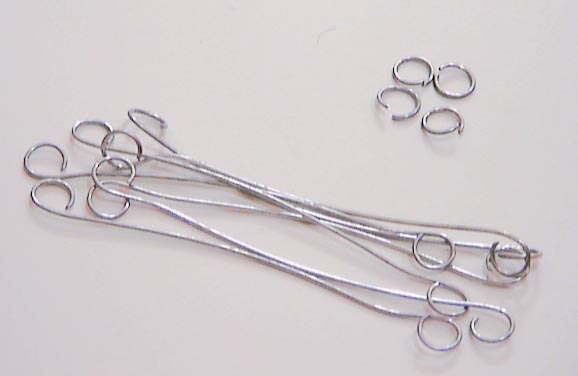 Step 5 - Cut the rings - Use the wire snips to cut the rings apart. Cut along the length of the coil. 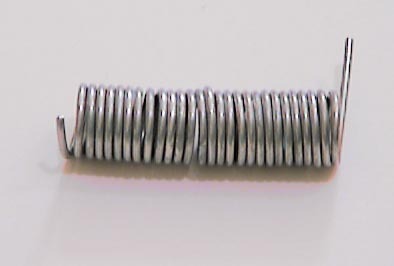 There will be a small amount of waste at each end of the coil. Cut straight through. Often I can cut several rings at once; it is limited by how far the wire snips will fit into the coil. Go slowly on the last few rings to avoid shooting bits of wire across the room. Done - Set the rings aside for use in assembling the links and attaching the tags. 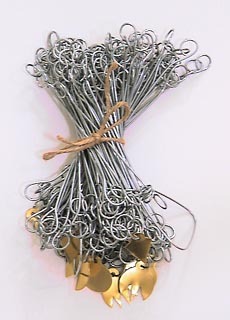 A chain needs 98 regular links and two handle links. The length of the link plus the inbetween ring(s) must be 7.92 inches. When winding the links, one need not be perfect; the length of the links can be adjusted as the chain is assembled. 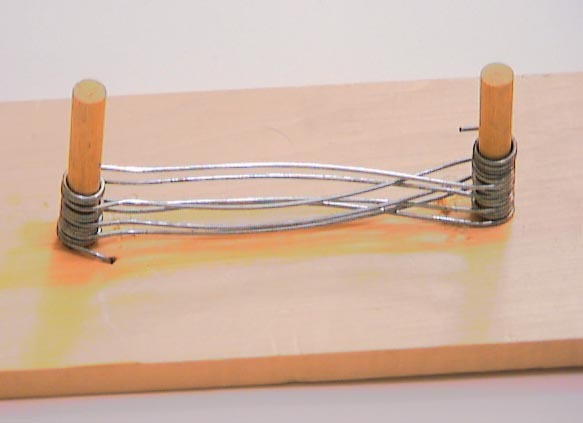 A winding jig is needed to make links. See the materials list for details. Step 1 - Cut some wire - Cut off enough wire to make a sensible number of links. I found that I could make seven links at a time. If I attempted to make more, my needlenose pliers didn't have enough jaw depth, and the additional links tended to be short. Around 12 inches of wire is needed per link. I found that the appropriate length was roughly 2 loose coils off of the spool of wire. 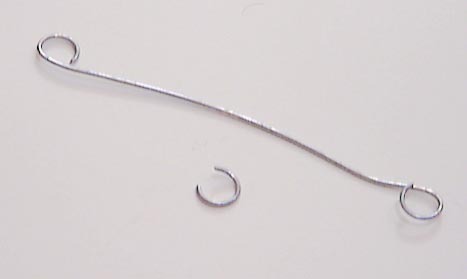 Step 2 - Start the wire - Put one end of the wire in the small hole in the jig. 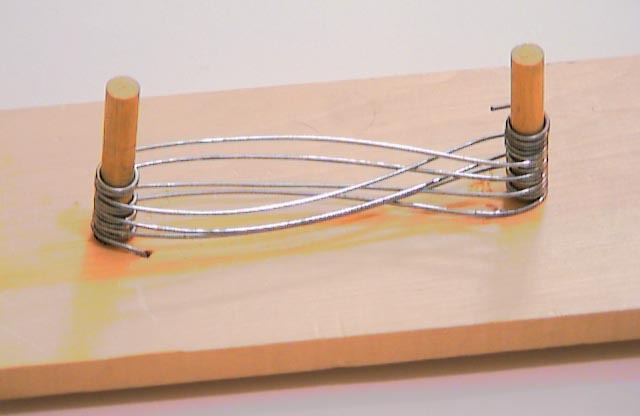 Bend the wire over 90 degrees so that the coil is flat with respect to the jig board. Step 3 - Wind around the first dowel - Insert the jig dowels into the holes. 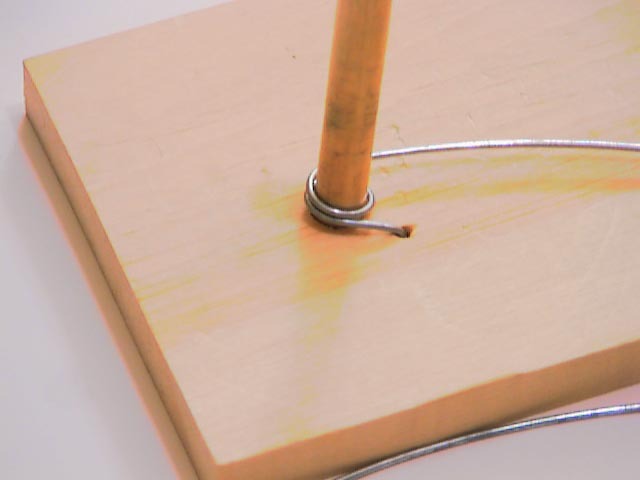 Bend the wire around the dowel nearest to the starter hole, keeping it tight to the dowel. Start winding on the side furthest from the second dowel (henceforth referred to as the outside of the dowel), and go around 1 1/2 times. 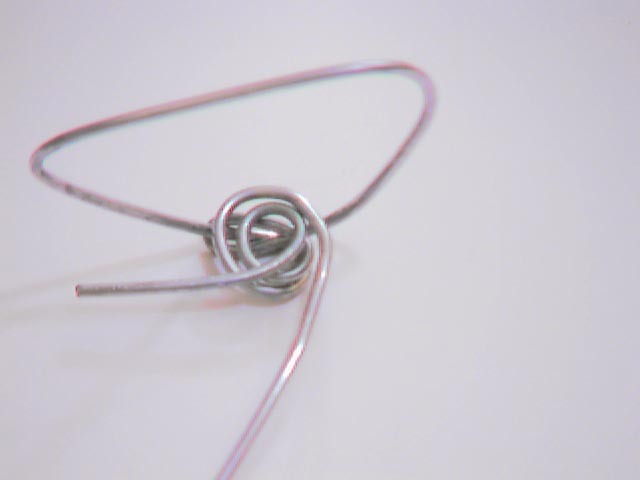 Do not overlap the wire; rather, put the second coil above the first. There will be one level of wire at the inside of the dowel and two on the outside. Step 4 - Wind around the second dowel - Switching to the opposite side of the second dowel, wind the wire 2 1/2 times around the second post. 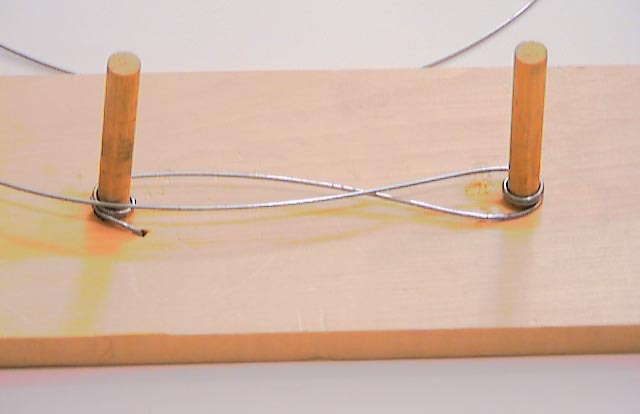 The wire will form either an 'S' or backwards 'S' shape between the dowels. There will be two levels of wire at the inside of the second dowel, and three levels on the outside. Again, make sure the winding is tight to the dowel and that the wire does not overlap. Step 5 - Wind the rest of the links - Continue in the same manner, switching sides when switching dowels. Wind 2 1/2 turns around each dowel. Proceed until the desired number of links are wound. Unless the dowel holes are drilled very precisely in the jig, the dowels will have a tendency to tilt in toward the center, making the later links slightly shorter than the first few links. Although it would be best to prevent this tilting in, winding the later links slightly looser seem to work well enough. 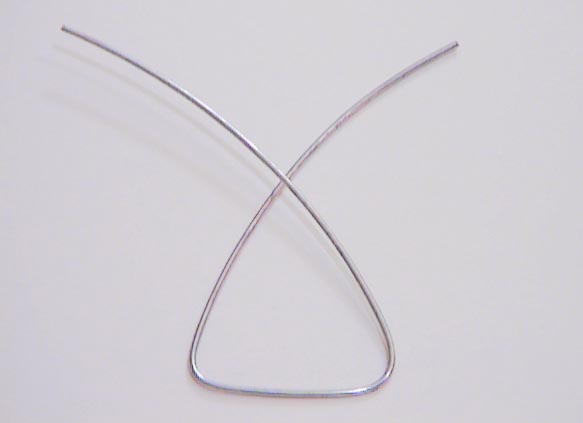 Note that the crossing point of the links will not be centered between the two dowels due to the residual curvature of the original wire; this will be corrected for later. Step 6 - Wind any remaining wire into rings - If there is any significant amount of wire left, wind it around the dowel it is closest to. This can be turned into additional rings to put between the links. Note that two short links will be needed as part of the handles. 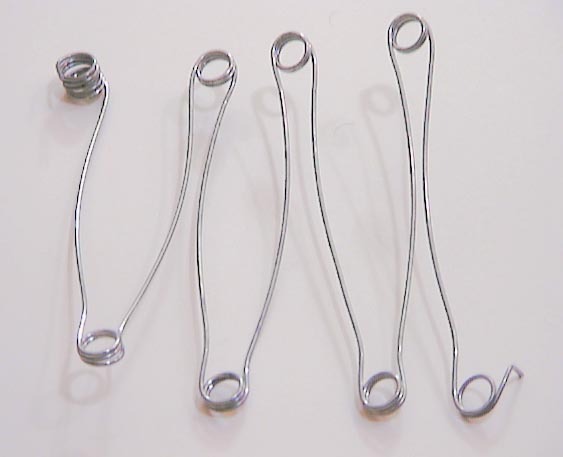 For these, leave the excess wire (at least a links worth) straight so that it will have only one eye. See the section on handles for details. Step 7 - Form the neck of the links - Use the needlenose pliers to squeeze all of the links a short distance from each of the two dowels. 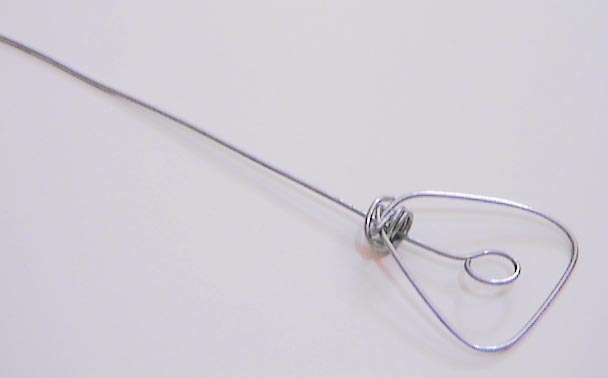 This puts an angled neck into the link, straightens the wire somewhat, and reduces the residual curl from the wire coil. This step is not strictly necessary, but it does make forming the links easier. Step 8 - Remove from the jig - Take the links off of the jig. This is where having removable dowels comes in handy. After removing the links from the jig, use a flat bladed screwdriver to slightly pry apart the inside end of each link junction (the part of the eye where there are two thicknesses of wire). This will make cutting the links easier. 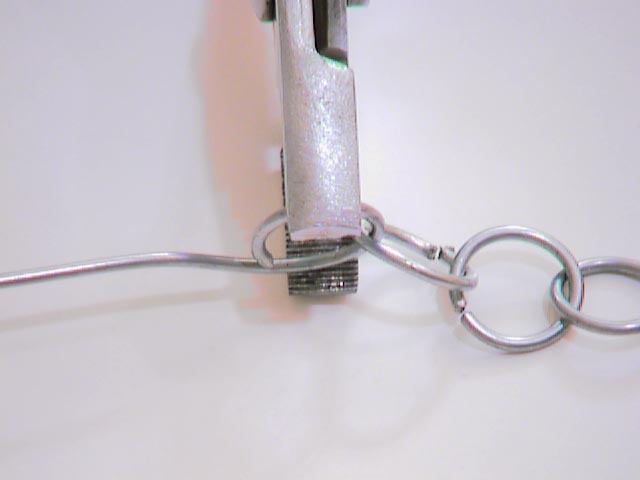 Step 9 - Cut off a link - Use the wire snips to cut off a link. 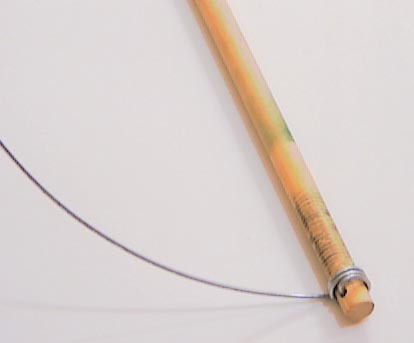 Cut as close to the shaft of the link as is convenient so that the eye is nearly a complete loop. There will be a slight gap. 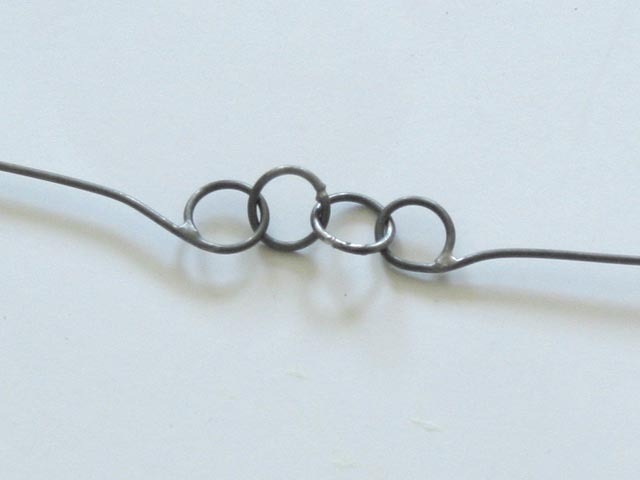 Between each link there is around 3/4 of a ring of scrap. 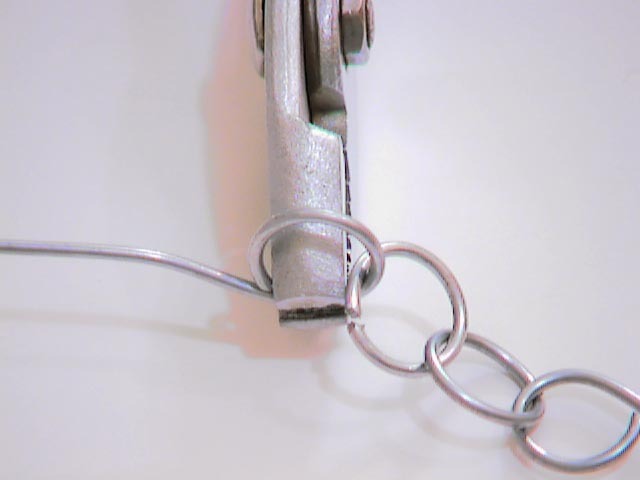 Step 10 - Cut the rest of the links and rings - Use the wire snips to cut off the rest of the links. Also cut any spare rings that were wound. 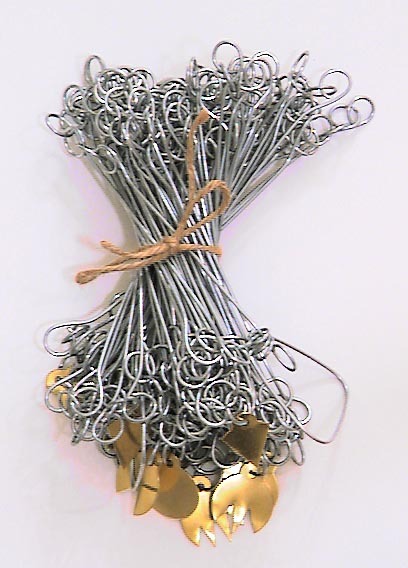 Step 11 - Straighten the links and close the eyes - Lay a link on a flat surface (such as the jig). Flatten any bend in the link. Next take the regular pliers and close each eye. The eye can be closed in two manners: (a) by squeezing it with the jaws of the pliers, and (b) by grabbing the back of the eye (away from the opening) and rolling the eye closed. Method (a) lengthens the link somewhat, method (b) shortens it. 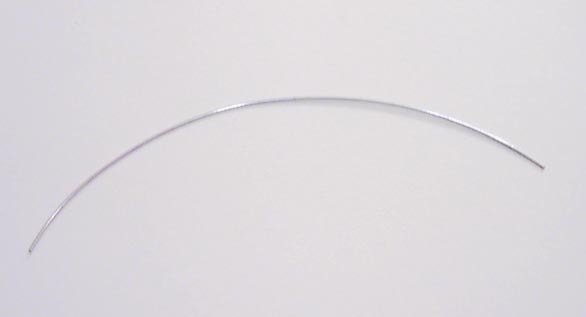 Ideally, the final link needs to be 6.92 inches (7.92 less the inside diameter of the rings). Make the gap at the eye as small as possible. Step 12 - Form the neck near each eye - Form the neck of the link by placing the link on a flat surface, and pushing down on the eyes, keeping the eye opening upwards. The shaft of the link should be fairly straight. Done - The links are ready to be added to the chain. They will most likely need some slight length adjustment at that time. A chain needs a tag to mark every ten links, using a total of 9 tags (the ends are not marked by tags). Two tags of each of four shapes are needed, plus one round tag for the center. Historically, the tags varied quite a bit. Step 1 - Mark the tags - Mark the tags for cutting. Many different shapes can be used. I chose to make simple tags based on the premade round ones that I had purchased. Transfer the design to the tags using a pencil. Step 2 - Cut the tags - I used the wire snips to cut the tags. This had the disadvantage that it bent the tags as it cut them. I think a metal bandsaw would be a preferred method. Step 3 - Flatten the tags - Use the needlenose pliers to flatten out the tags. They won't be perfect. 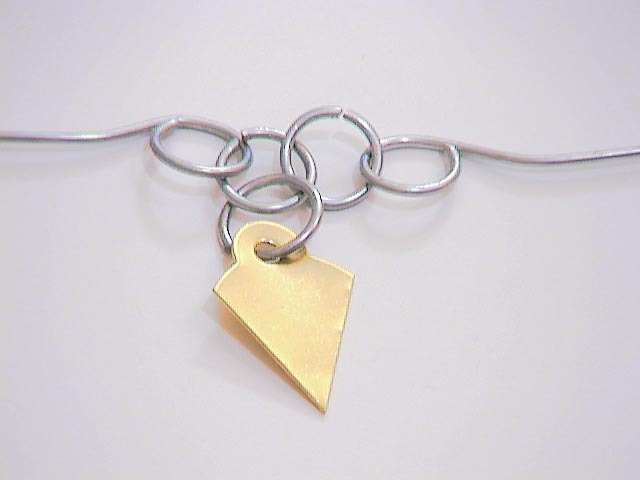 Step 4 - File the edges - Use the triangular metal file to smooth the cut edges and the points on the tags. By angling the file, a very tight corner can be reached. Done - The tags are ready to be added to the chain. The handles on the chain form the end links. Specifically, the outside edge of the chain is the point from which things are measured. Historically, chains either had wire handles or cast brass handles. Often, but not always, the handles act as swivels to aid in untwisting the chain. Some chains, but by no means the majority, also had a swivel link somewhere near the center in place of one of the regular links. Step 1 - Cut some wire - Cut off around 14 inches of wire. This will be slightly more than is necessary for a handle. 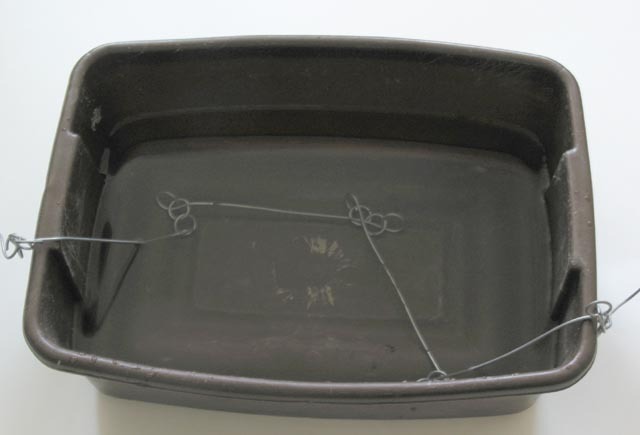 Step 2 - Form the gripping surface - Put three fingers at the center of the wire and bend the wire around the fingers to form an isosceles triangle. 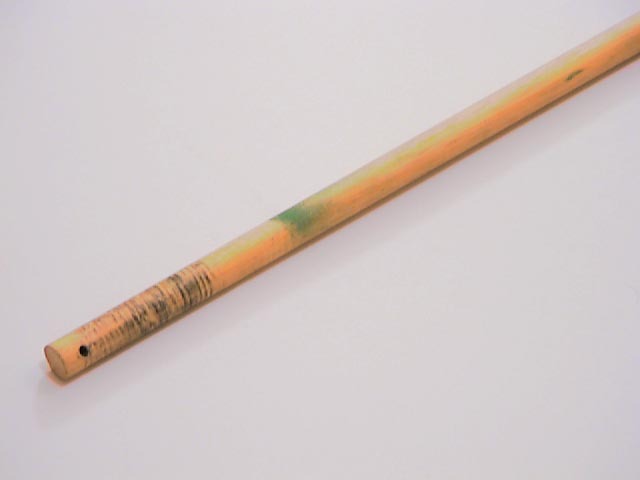 Step 3 - Start the neck - At a slight distance more than the width of the grip, bend both sides of the handle inward, leaving an overlap of around 1/2 inch. 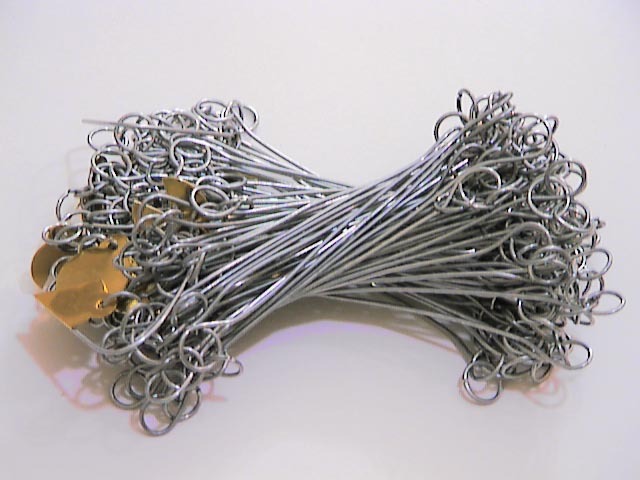 Step 4 - Begin wrapping the wire - Starting with whichever side of the neck is further from the grip, fold the wire around the opposite side, pinching it tightly. The wire must be put through the handle. The needlenose pliers work best here. 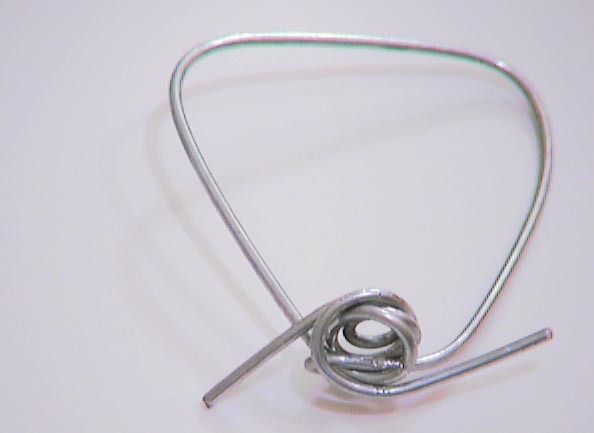 Step 5 - Form the eye - Using the needlenose pliers, form a loop of wire. 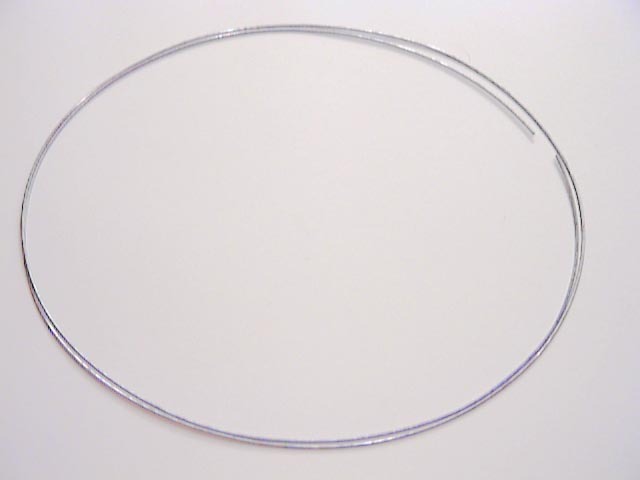 The loop must be at least as large as the diameter of the wire and no larger than 1/4 inch in diameter. I found it useful to use the regular pliers to grip the wire. Make sure the loop is on the same side of the neck as the grip. Step 6 - Reinforce the eye - Wrap the second side around the first loop. This should either be immediately outside of the first loop or between the first loop and the neck (and always inside of the sides of the handle). Step 7 - Reinforce the base - Continue wrapping the same wire, this time forming another loop on the other side of the neck (away from the grip). Step 8 - Fold in and clip the ends - Fold in the ends of the wires. 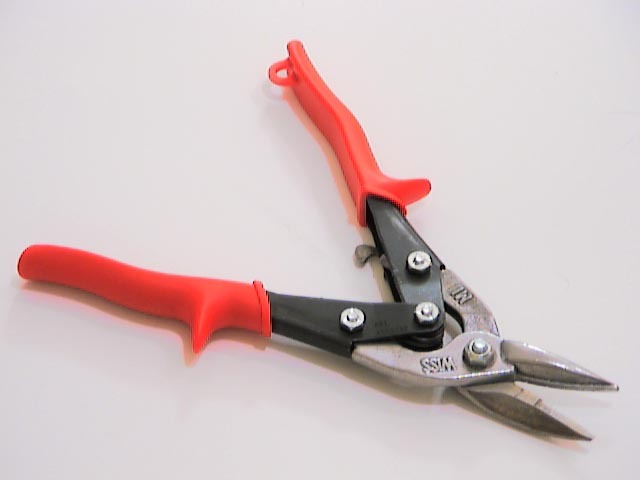 Use the wire snips to cut them as close as possible to the bulk of the handle. 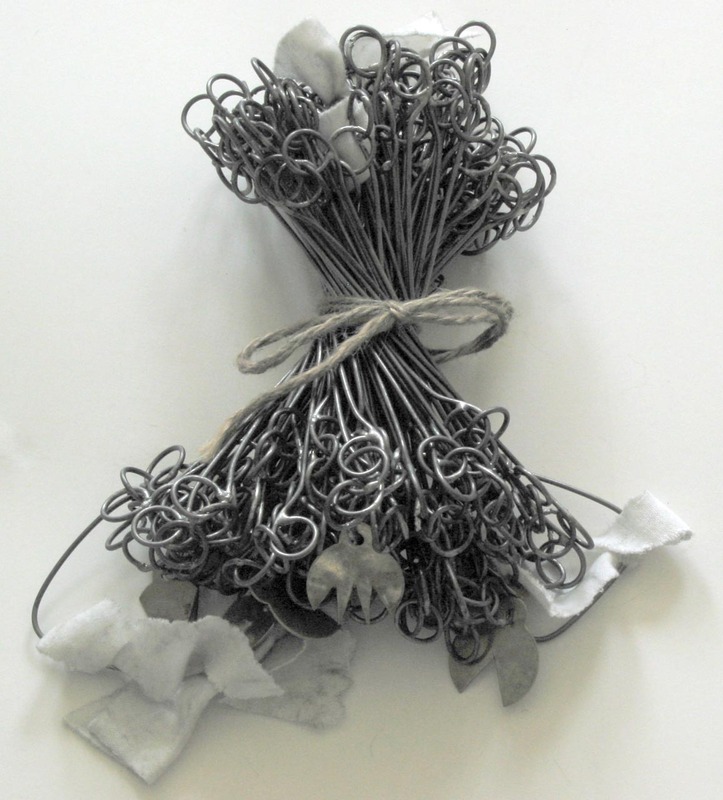 Fold in any protruding wire. Step 9 - Form one end of a link - Form one end of a link on the link jig. Close the eye and form the neck. The free end should be long enough to form a regular link, plus a few inches (it is easier to work with a long end). 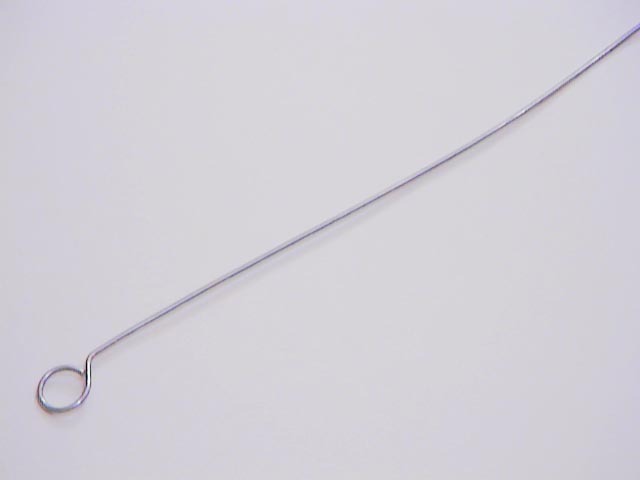 Step 10 - Put the link in the handle - Insert the link into the handle so that the eye is on the inside of the handle. The link should spin freely and not have any significant preference in orientation. If, when the free end of the link is rotated and pulled, the eye of the link moves closer and further from the handle grip, then either the handle or link needs some adjustment. 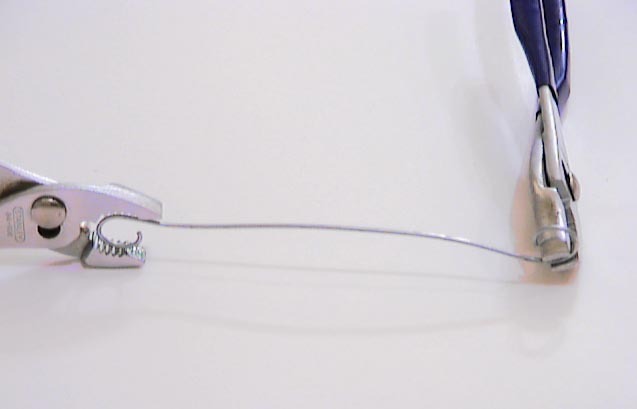 The neck of the link can be flattened, and the loop on the handle can be levelled. There will always be a slight preference, but it should be less than a wire thickness in size. Step 11 - Start winding the free end - Insert the free end of the link into the ring winder. Start winding the free end, making sure that the eye formed by the loops of wire on the ring winder are in the correct orientation to form an 'S' shape with the already formed link eye. 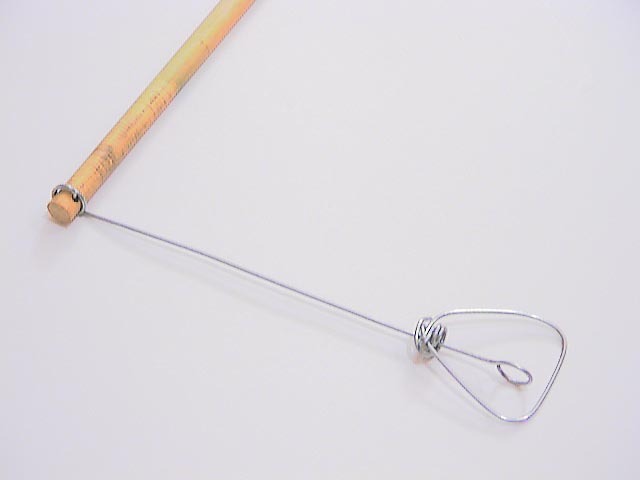 Step 12 - Wind to the correct length - Wind the link wire onto the ring winder until the total length of the handle and link (including the eye formed on the winder) is only slightly longer than the correct length. For a chain with two rings between each link, the correct length is 7.42 inches (7.92 minus the inner diameter of half of the rings between the links). This is the distance from the outside of the handle grip to the inside of the far link eye. Step 13 - Cut off and form the second eye - Cut the link and eye off of the ring winder. 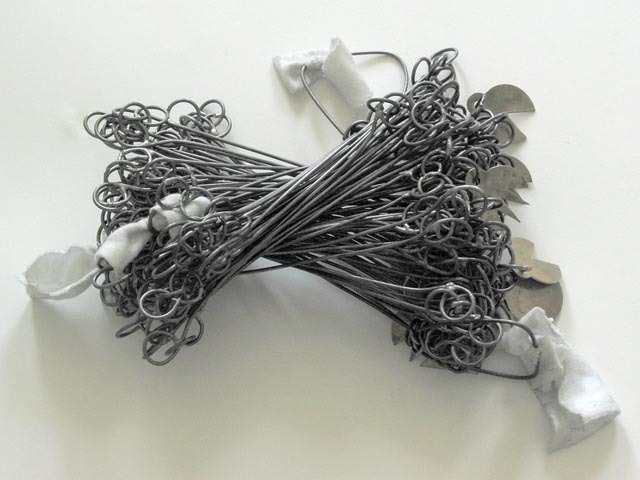 If there was a lot of extra wire, it is likely that a few rings can also be made. 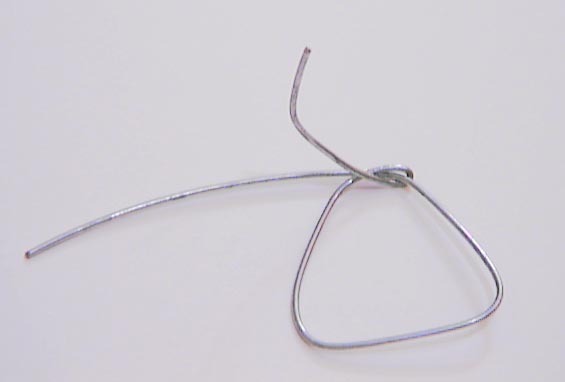 Clip the wire so that an eye can be formed in the same manner as when the links are cut from the link jig. Form the eye and neck. Ideally, the combined link and handle will be the correct length or a little longer (it is easier to shorten a link than lengthen it). Done - The handle is ready to be added to the chain. The chain can be assembled as the various links, rings, handles, and tags are finished. This is more satisfying than waiting until all of the parts are made, as the progress is more evident. 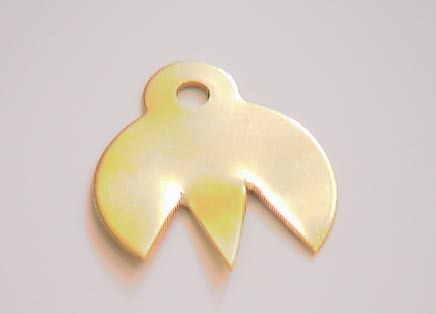 If the chain is to be hardened, the tags should not be added until after hardening. 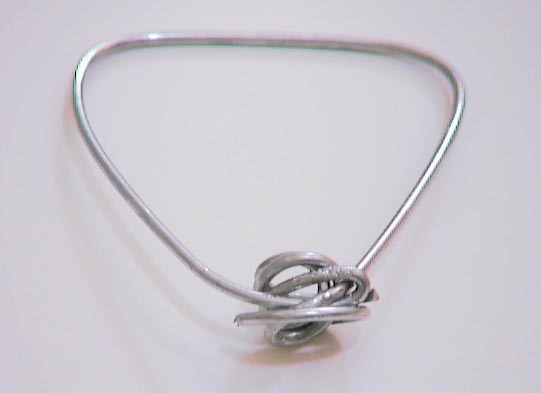 Step 1 - Attach a ring to a link - The links are attached to each other with the rings. The handle is treated as an ordinary link for assembly purposes (except, of course, that the handles go at either end of the chain). Place a ring through the eye of a link. Close the ring using the pliers, making sure that the gap is small and the wire ends are lined up. Step 2 - Attach another ring and another link - Put another ring through the ring that was just added. Before closing the ring, put the ring through another link. Close the ring as before. Step 3 - Shorten the link if necessary - Compare the link and the associated rings to a ruler to make sure it is the correct length. It is best to adjust a series of links in a row to reduce the likelihood of error build-up. I found it easiest to mark a vertical section of wall for a distance of ten links, then hang the chain from a hook at the top. This provided a small tension on the chain. I adjusted the links starting at the top and working my way down. If a link is too long, it can be shortened by grabbing the back of the eye with the pliers and rolling the eye toward the center of the link. Step 4 - Lengthen the link if necessary - The link can be lengthened by crushing the eye somewhat. It can also be lengthened by unrolling the eye (the opposite of the preceding step), then squeezing the open gap in the eye closed. 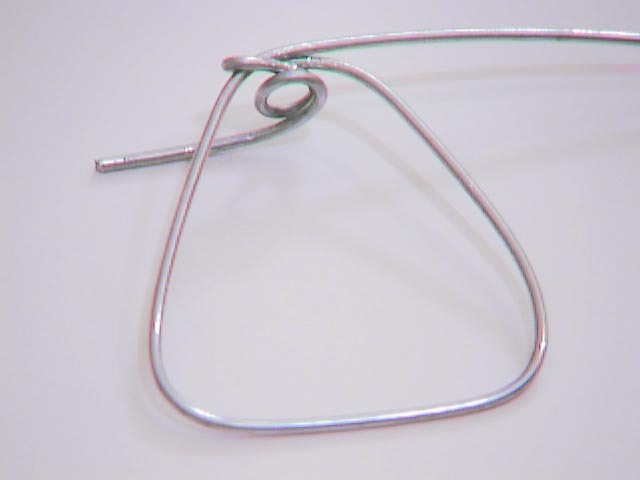 Step 5 - The neck can also be adjusted - The neck can be flattened to elongate the link or bent more to shorten the link. This is generally a smaller adjustment than working on the eye. Continue attaching the links until the entire chain is assembled. If the chain is to be hardened, it should be done at this time. Step 6 - Attach the tags - Attach a tag every ten links. The tag is attached with another ring. 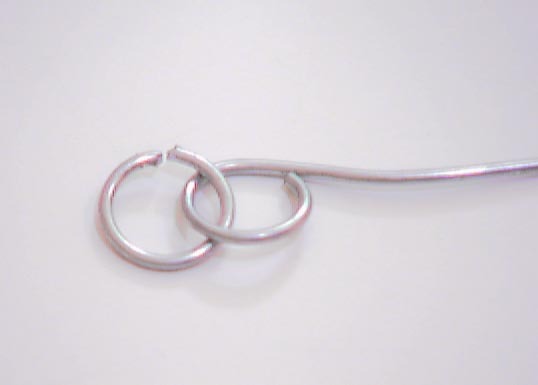 It doesn't matter to which of the two inter-link rings the tag ring is attached. The tag with 1 point goes at link 10 and 90, 2 points at 20 and 80, 3 points at 30 and 70, 4 points at 40 and 60, and the round tag at 50. Remember that the handle is a link. Done - The chain is complete. The chain should be verified against a standard to make sure that it is exactly 66 feet in length. Note that the tension with which the chain is held will change its length. Therefore, make sure that when verifying the chain length the tension is the same as that which will be used in the field. Because the chain is made from mild steel, it will have a tendency to bend under use. This can be reduced by hardening the steel. To harden steel, the steel needs to be heated to 1600 degrees Fahrenheit, then quenched in water. This makes the steel hard, but brittle. To reduce the brittleness, the steel is then tempered by raising it to 400 degrees Fahrenheit for an hour or so, and then letting it cool normally. If the steel does not have enough carbon in it, it will not harden. Also, if the steel is galvanized, the zinc will melt or vaporize in the hardening process. Historically, many chains were hardened. I have not hardened my chain. Historically, some chains had the gaps in the link eyes and rings brazed closed. 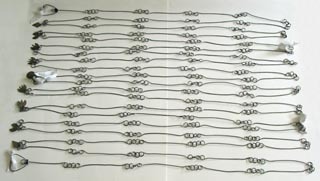 The chains I have examined look like they were soldered with a lead or silver solder. Initially, I didn't braze my chain. However, once I took the chain into the field, I found that it would occasionally come apart, especially when dragging it through brush. While one could be careful and still use the chain, I wanted to be able to use it properly, so I decided to braze it. 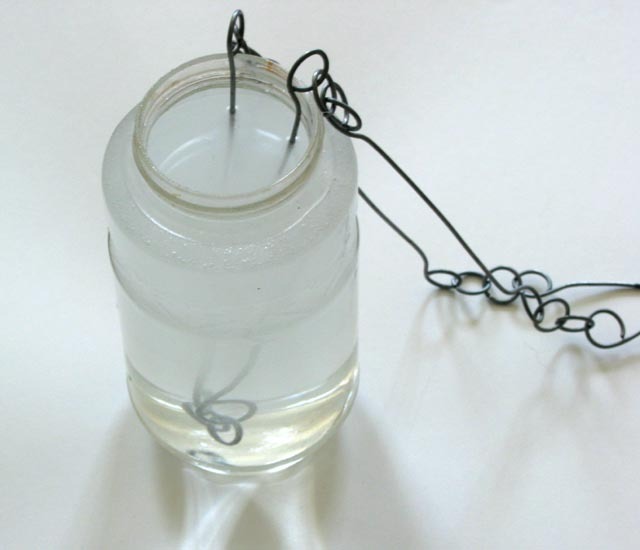 Muriatic Acid - Because I started with galvanized wire, I needed to remove the zinc before I could braze the chain. Muriatic acid does this quite efficiently, though it is quite toxic. Be sure to follow all the proper safety guidelines when handling the acid. 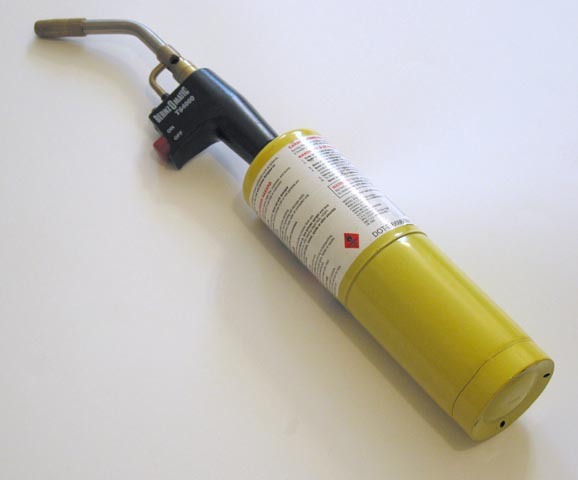 Mapp Gas Torch - I used a mapp gas torch to heat the chain to braze it. This is similar to propane, but burns hotter. Propane would probably have been sufficient. 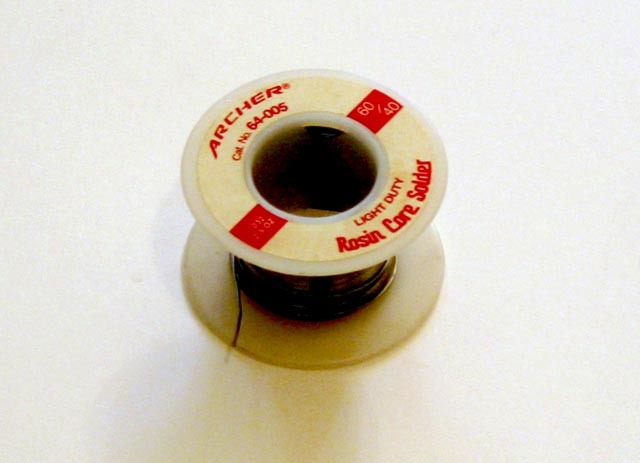 Solder - I used a lead/tin solder, primarily because it was available. 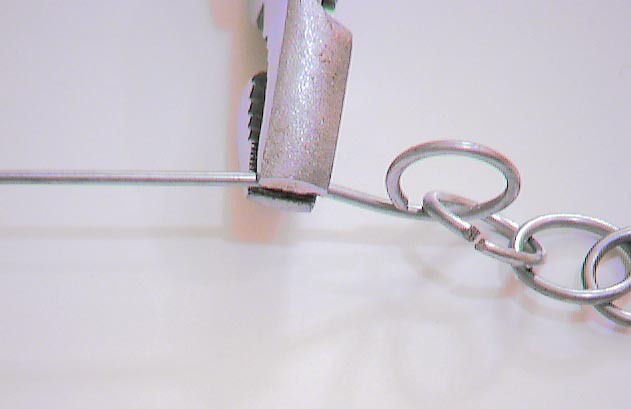 The solder should be roughly the thickness of the wire used for the chain. Very thick solder doesn't work well, and thin solder is more annoying to apply. 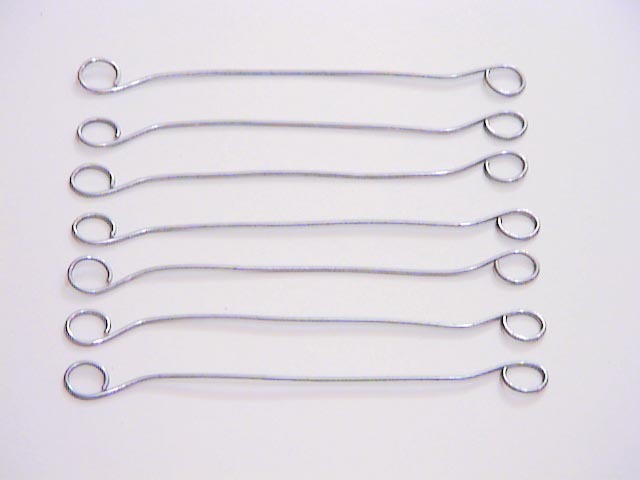 Water - (not shown) - For quenching the brazed links and for rinsing the muriatic acid off of the links. Pliers - In addition to the common-sense safety items, I used a pair of pliers for manipulating the hot links. This wasn't often necessary, as the neighboring links didn't heat up and could be used to move the working area. 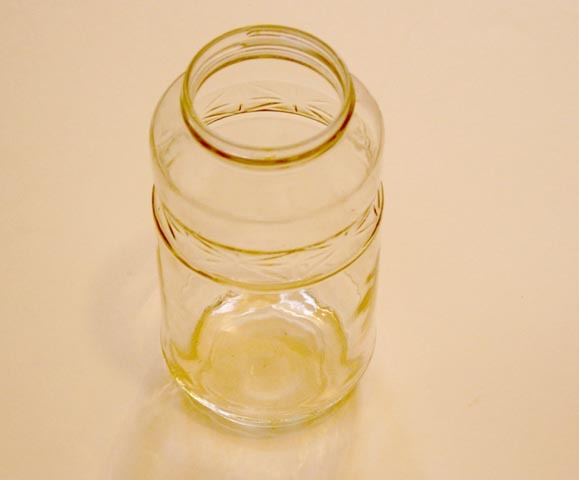 Glass Jar - I used a glass jar for the muriatic acid. This kept the open surface area to a minimum, but still allowed easy immersion of the areas to be brazed. 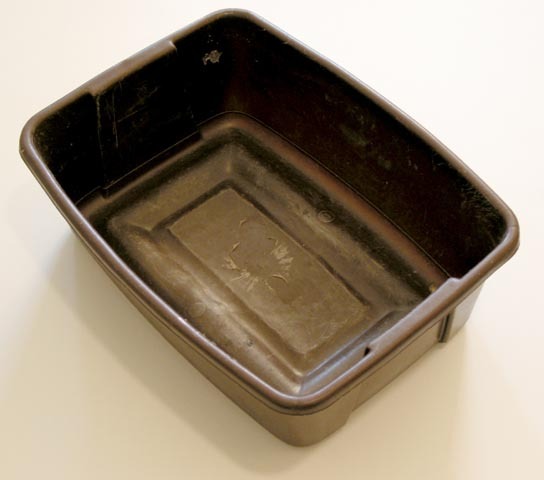 Bucket - For holding the rinse/quench water. Grill - (not shown) - As a work surface, I used a barbeque grill. There may be a better choice, as I ended up splashing some of the solder on the grill, but at least the grill was not flammable in any manner, and allowed the placement of very hot items on it. Note: I brazed the chain outside, away from my camera equipment. 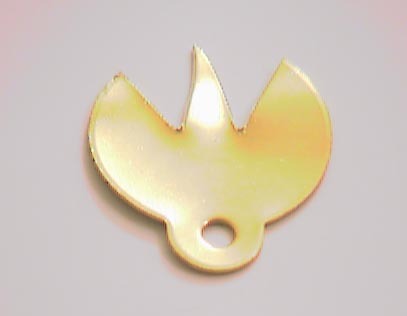 Therefore, the following pictures are a recreation of the brazing process. The pictures are representative of what needs to be done, but do not have the same exactness as the rest of the description. Step 1 - Remove the Zinc - Put the junction between two links into the jar of muriatic acid. Hydrogen gas bubbles off from the links and rings as the acid reacts with the zinc. After many links have been done, the acid will become tinged with suspended zinc chloride. I made sure that at least half the length of the link was submerged in the acid, so that the entire chain would be free from zinc when I was complete. The brass tags are not substantially affected by the muriatic acid, so I did not remove them prior to brazing. This allowed the rings holding on the tags to also be brazed. Also, I dipped the handles into the muriatic acid; this was solely to obtain a uniform appearance to the final chain. Step 2 - Braze - Use the torch to heat the link eyes and rings. When the wire is hot enough, touch it with the solder. 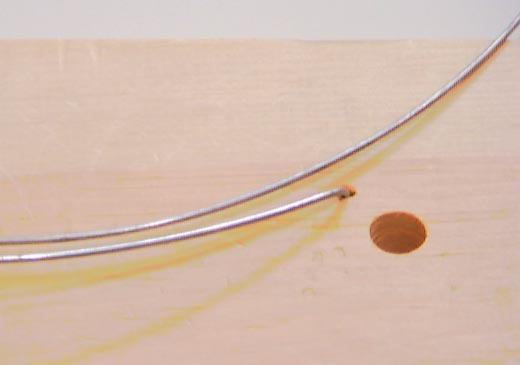 When this is done optimally, the solder melts and flows to fill the slight gap between the link eye and the link shaft or the gap between the ends of the rings. Sometimes I had to reheat the wire and reapply the solder. Step 3 - Rinse and quench - Put the brazed links into the bucket of water. This stops the acid from further etching the steel wire, and also hardens the solder. Step 4 - Inspect the brazed points - Check each braze point carefully to ensure that it is fully joined and reasonably strong. If there is a problem, braze the area again. Repeat all of the steps for all of the link eyes and all of the rings. Done - The chain can now be used vigorously. It is strong enough that I and an assistant can carry it over obstacles by keeping enough tension on the two ends. I rinsed the entire chain once more, then oiled it lightly with WD-40 to keep it from rusting. Here are some photographs of the completed chain. The first three photographs are of the chain prior to brazing. The rest of the photographs are of the chain after it has been brazed and has been used in the field several times. I tied strips of white cloth to the handles and every 25 links to make the chain easier to see; otherwise it practically vanishes when placed on the ground.